Celebrating the life of Raymond W. Littleton, Jr.
Obituary for Raymond W. Littleton, Jr.
Raymond W. Littleton, Jr., age 66, of Wind Ridge, PA, passed away Tuesday, February 26, 2019 in Premier Washington Health Center, Washington, PA.
Born January 29, 1953, he is the son of the late Raymond W. and Joanne (Strope) Littleton, Sr.
Raymond graduated from Cameron High School. He attended Mt. Carmel Church of God in Springhill Twp. until he was no longer able due to his failing health. Raymond married Kathy L. Cook on December 18, 1982 and they were happily married for 36 years. He was employed with Camforge, Inc. in Cameron, WV as a Machinist who made crane hooks until he retired in 2016. In his spare time, Raymond enjoyed hunting and fishing. 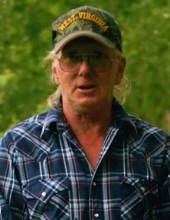 In addition to his wife, he is survived by three children, Stacy (Larry) Pettit, Michael Littleton and Christopher Littleton; four grandchildren, Noah, Neil, Avery and Casey Pettit; three brothers, Harold (Chris) Littleton, Roger (Amanda) Littleton and Charlie Littleton; two sisters, Lorna Wise and Diane Lemmon. In addition to his parents, he was preceded in death by one brother, Harry Littleton. Friends will be received on Saturday, March 2, 2019 from 11:00 a.m. – 1:00 p.m. at Kesterson-Rush Funeral Home, LLC., 3275 W. Roy Furman Hwy., Rogersville, PA 15359. Telephone: 724-499-5181. A funeral service will follow at 1:00 p.m. with Pastor Jack Gray, officiating. At Raymond’s request, cremation will follow after the funeral service. To send flowers or a remembrance gift to the family of Raymond W. Littleton, Jr., please visit our Tribute Store. "Email Address" would like to share the life celebration of Raymond W. Littleton, Jr.. Click on the "link" to go to share a favorite memory or leave a condolence message for the family.